Newcastle has recently been voted the UK's best short break destination and this vibrant city is now considered one of the world's new cultural Meccas, with many world-class, dynamic attractions. 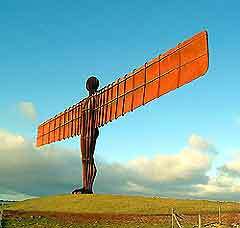 Full of history, Newcastle city centre actually has more listed classical buildings than any other city in the United Kingdom, from the elegant streets of Grainger Town to the contrasting impressive contemporary architecture of the Gateshead Millennium Bridge. Newcastle-upon-Tyne is the largest city in the north-east of England, with adjoining Gateshead, and many of the city's grand 19th-century streets follow the attractive River Tyne, which meanders close to the heart of the city. Newcastle's city centre is highly walkable and lies on the northern banks of the Tyne, while Gateshead is to be found on the southerly side of the river. The quayside area of Gateshead is simple to reach by pedestrian bridges and well connected by the underground Metro train network. For tourism advice in Newcastle, head to the Tourist Information Centre on Grainger Street, or visit the train station, on the southerly side of the city, off Fourth Street and Railway Street. Also of note is the Gateshead Quays Visitor Centre, which resides within St. Mary's Church, on Oakwellgate. 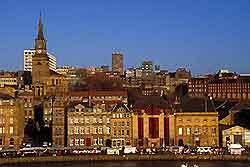 There are a large and varied selection of hotels in and around Newcastle-upon-Tyne and the Gateshead area. Popular areas in which to stay include the Quayside, the Jesmond district, Osborne Road and within the Haymarket. Business visitors in Newcastle can make hotels very busy during the week and as a result, many city hotels now offer discounts for Friday and Saturday night lodging. Newcastle United, the city's premiership football club, plays regular home games at St. James's Park Stadium, which seats over 52,000 people. With a large number of loyal supporters, tickets to Newcastle United Football Club matches should always be booked in advance. St. James's Park Stadium is the second-largest football stadium in the United Kingdom, as well as being the oldest football stadium in the North-East, with the first game of football being played here more than 125 years ago. Other attractions in the Newcastle-upon-Tyne area include the Tyne Bridge - an imposing bridge which has become one of the great symbols and landmarks of the city; Grey's Monument - a vast monument situated within the central shopping centre; the Angel of the North - the biggest sculpture in the UK; the Sea Life Aquarium - featuring underwater tunnels, large sharks, friendly stingrays, fish and a host of other marine animals; Segedunum - a historic site with many important Roman artefacts; Bowes Railway - an unusual steam railway, which incorporates a rope hauling system; and Newcastle Ferry Cruises - one of the most pleasant and relaxing ways to see many of Tyne and Wear's most striking tourist attractions. 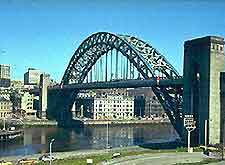 More information about Newcastle Tourist Attractions and Newcastle Landmarks. Theatres in and around Newcastle include Caedmon Hall, Live Theatre, Newcastle Opera House, Newcastle Playhouse and Gulbenkian Studio Theatre, People's Theatre and the Theatre Royal, all of which have regular productions and shows throughout the calendar. Attractions close by include Alnwick Castle, Bamburgh Castle, Dunstanburgh Castle, Farne Islands, Kielder Lake, Lindisfarne Castle, Lindisfarne Priory, Wallington House and Gardens, Warkworth Castle and Washington Old Hall. Newcastle-upon-Tyne also has a number of appealing museums, which combine to provide an array interesting information relating to the city's diverse history. Some of the major cultural highlights include the Discovery Museum - recreating local life from Roman, medieval and Georgian times to the 20th century; the Museum of Antiquities - with an outstanding collection on Roman artefacts, including many that relate to Hadrian's Wall; the Shefton Museum - transporting you into the amazing world of Greek archaeology and art; the Military Museum - home to more than 50 historic wartime and post-war military vehicles; the Hancock Museum - one of the most popular museums in the Newcastle-upon-Tyne area and the north's leading natural history museum; the Life Science Centre - a £70-million museum featuring many other fascinating exhibits, with hands-on, mind-blowing fun for all the family; the Stephenson Railway Museum - housing a large collection of important historic steam and electric locomotives; and the Trinity Maritime Centre - celebrating the history of the River Tyne with many detailed scale models of historic regional ships. The city of Newcastle is home to a small gay and lesbian LGBT scene, which is concentrated at the far west of Newcastle city. Known as the 'Pink Triangle', the Newcastle gay scene features an increasingly number of popular bars and clubs, and is just a few minutes walk from Central Station. Newcastle has one of the most successful universities in the United Kingdom, highly regarded for its teaching and excellent research facilities. With excellent teaching standards, an attractive campus in the centre of Newcastle-upon-Tyne, an award-winning library and a wide range of outstanding features, the university is home to more than 240 programmes of study. The campus comprises many different departments and schools, and over 16,000 students, ranking amongst the largest employers in the area, currently employing over 4,000 staff. Newcastle University has around 2,500 full-time students who come from abroad and more than 100 countries are represented on the campus itself. 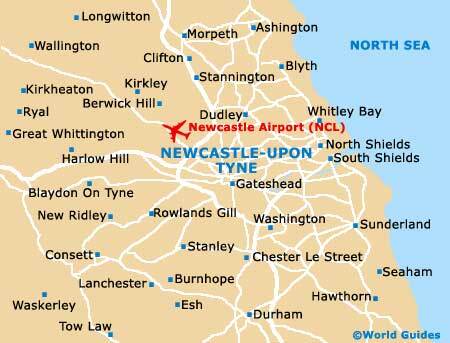 With an excellent public transport system, including the Metro - an efficient underground train network, and nearby Newcastle Airport, situated just 10 km / 6 miles from the centre, the city is surrounded by many major roads and motorways. Newcastle is a busy city throughout the year, with many major festivals and events', ensuring that it remains exciting, full of energy and distinctly unique, whenever you visit.